"As an emerging med-tech company going through natural processes of developing a requirements management system, Cognition has made this easier for us." 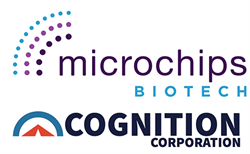 Cognition Corporation, a software company specializing in medical device compliance and commercialization, has just released a new case study in partnership with Microchips Biotech, Inc. Microchips Biotech, Inc. is developing implantable drug delivery and disease management systems to transform the lives of patients and revolutionize healthcare delivery. The case study details their adoption of the Cockpit Platform as a tool to help empower their growth and support the challenges of growing project portfolios. “We realized that as projects expanded, we needed a solution to support and augment the management of design requirement and risk management activities,” says a Microchips Sr. Systems Engineer. The case study also discusses how Microchips has augmented their design requirement and risk management activities with Cockpit features such as traceability, requirements management, and compliance-ready templates. With design control and risk management templates, configuration support from Cognition, and robust data management capacities Cockpit provides them, Microchips has been able to empower their product development process for long-term growth. “As an emerging med-tech company going through natural processes of developing a requirements management system, Cognition has made this easier for us,” says a Microchips Sr. Systems Engineer. Cognition is proud to have collaborated on this case study with Microchips, and hopes to continue the relationship as they continue their growth.